There are many factors to consider when talking about marble for counters. The main one seems to be DOES IT STAIN? This is the big question many people renovating or building want to know? The whole marble versus granite or quartz debate plus many more considerations that can be overwhelming. This is not to be an exhaustive study of each but I will give you some information on what I have learned recently working with clients and in my own home. I will also link to some great posts and some great information and perspectives I have learned from other designers and bloggers. But first, let’s start at the beginning. My beginning. Isn’t marble super FANCY? First off, that was my misconception I had to get over, marble is not really that fancy or formal. Yes it’s beautiful but it’s not pretentious or overly dressy in my opinion. It’s actually a very natural and honest material. It was silly to think that it was too fancy for a cottage or casual living. It’s not at all, it works so well in an older home. Think France! 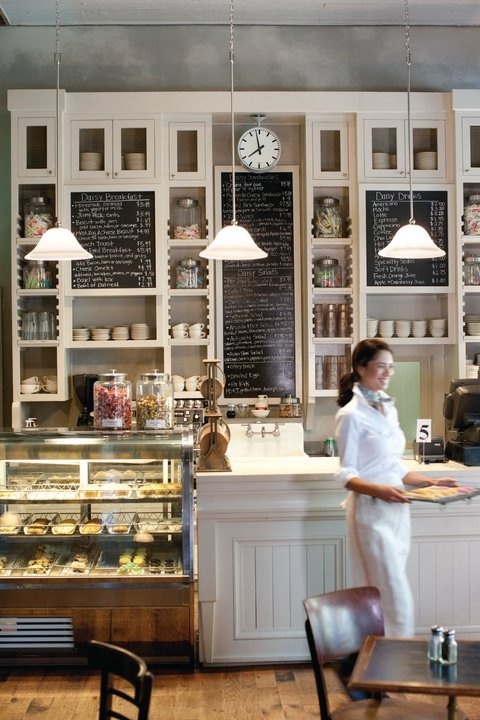 Think ice cream shops and charming bakeries. 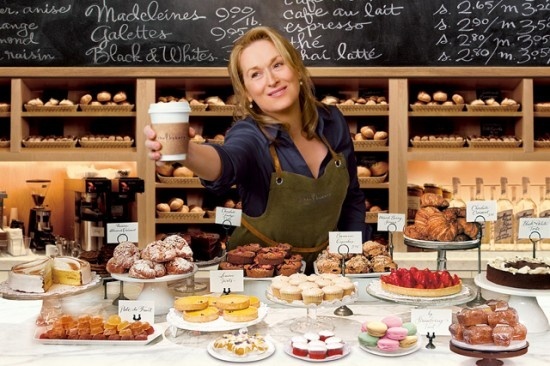 Like the bakery in Nancy Meyer’s film It’s Complicated. I don’t even know if thats marble Meryl Streep is leaning over but it sure looks like it. 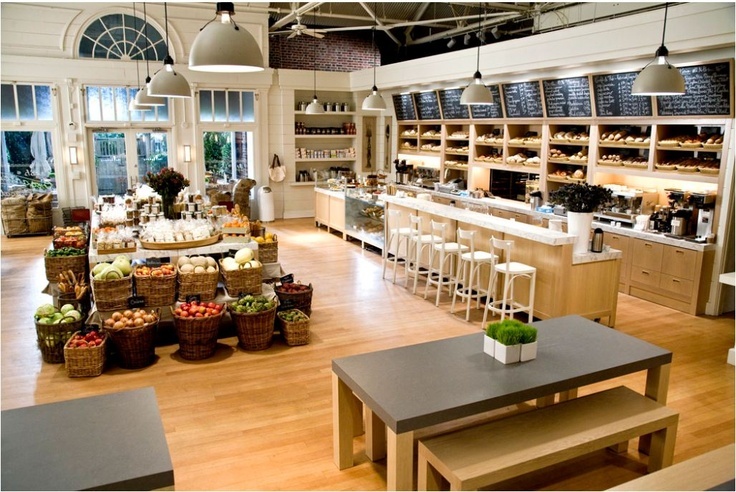 Larger shot of the same bakery from the movie, so charming. Or like you might find at Blue Eyed Daisy Bakeshop in Serenbe near Atlanta. It could be quartz but it appears to be marble. If you have travelled in Europe then you have seen marble in both art museums and in cafes. It’s used everywhere, from the elegant to the everyday, because it’s such a wonderful and beautiful material. Aren’t their DIFFERENT TYPES of marble? Yes, I have simple carrara marble. This is the least expensive (as far as I know;) and what I consider basic marble and more like what is used in cafes and casual settings (at least that is what I tell myself;). I believe Statuary marble is a brighter white and calacatta has heavier veining. Some of my clients WANT a heavy dramatic vein. I did not. All that being said, I have seen calacatta and other more heavily veined marbles than carrara used in cottage kitchens or on a large island and it looks so pretty in various settings. I just knew I wanted the grayish and less veined carrara that you can find for a such a reasonable price! You really just have to look at the slabs yourself and decide what you look you want in your home. Here is an article that sheds some light on the differences from Houzz. And honestly I think there are some conflicting descriptions and photos floating around the web about different types of marble. It really varies. Granted it is natural stone so its never going to be uniform so always try to see the slabs before you purchase and educate yourself before you invest. 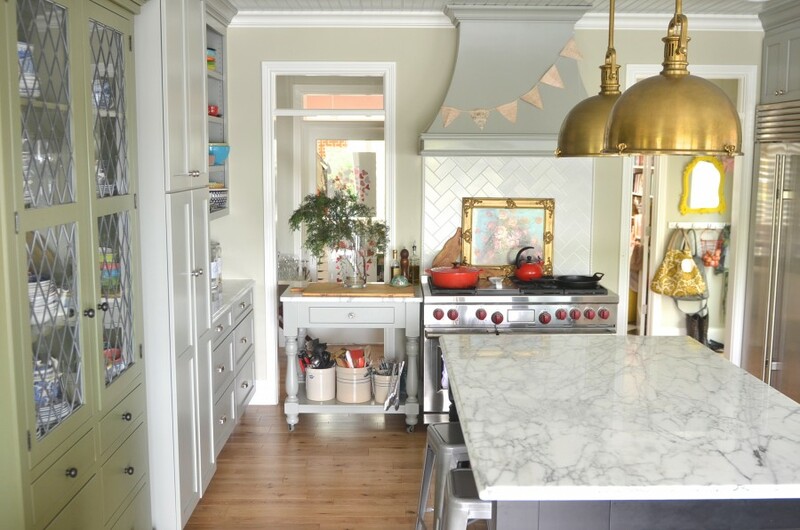 We used Carrara in the Louisana kitchen below. My clients love to cook and drink wine but are still glad they made this decision. You can see more of this home in my portfolio and in the before and after post of the kitchen here. DOESN’T IT STAIN Yes marble is a natural material and soft and porous and it can stain as well as chip and scratch. And yes it certainly etches. In fact, IT WILL ETCH. Based on what I have learned reading and talking to other decorators and homeowners, and experts, the polished marble (which is more dressy obviously) is beautiful but does etch and stain more so than a honed and sealed marble. Honed marble and wonderful new sealers prevent staining in most situations. A Houston company even offers a 15 year guarantee on stains (but NOT etches;) Everyone (except one blog comment on my last post) I talked to that has recently installed honed marble says “yes it etches some” and “yes I was nervous at first” but “I love it and would do it again.” I think it’s a personal decision. If you are a perfectionist and very type A, which I am not, then it’s probably not the material for you. But I am not type A, I have white slipcovers and boys so obviously a few water marks on my marble is not going to bother me. Lest you think I am too easygoing though. I did nearly stop breathing when my mom said “Henry used the self inking stamper on your counters but it MOSTLY came off” well it all came off but I was a bit concerned. I have honestly used the little magic eraser pads quite a bit to get some things out. Henry Mathis needs to be thankful for the invention of magic erasers! More battle scenes below from my own kitchen! So far it has all easily wiped up (knock on wood) Again mine is honed and sealed. Joan from the lovely blog, For the Love of a House, has an excellent post on marble for counters and she address the issue of staining and etching as well. She actually has some great photos that really capture “etching” and what it really looks like. And she reinterates the point IT WILL ETCH so know that going in. She also brings up how salesmen and contractors will try to talk you out of it so do your research and be ready to stick to your guns. Edie from Life in Grace also has written a great post on her experience with marble. She gives a really realistic and funny view of living with marble by discussing the Myers-Briggs personality test in relation–very funny but some truth to it no doubt! Her post also gives a great link on cleaning tips. Edie has polished marble but she says it quickly looked like her friends’ marble that was honed. She also has some great photos of etching and the effects of living and “patina” of her marble. I also love how she talks about how marble wears its “heart on its sleeve”…just like us, vulnerable but beautiful! Leave it to Edie to touch all aspects of this topic from the emotional and spiritual to the funny personality quirks of dealing with imperfections! So what is ETCHING? It’s just a colorless looking watermark. Usually wiping down with a warm cloth they go away. I think it’s important to dry them as well if possible. Joan mentioned above from For the Love of a House uses barkeepers friend. You can’t see them or photograph them easily (though Joan and Edie did;) but can see sideways in the light. Water spots usually wipe away but acidic things like lemons or pickles or tomatoes can etch more permanently. I haven’t had any major problems at all. I do keep several cutting boards out and we don’t drink red wine. My client that does drink a lot of wine has coasters for her bottles. This may sound really troublesome to you but its worth it. Especially when it feels 120 degrees outside in Texas and you touch that cool marble. Bottom line, etching will happen, its inherent to marble so be sure this isn’t something that is going to bother you down the road. What about QUARTZ? As gorgeous as it is, after research you may decide that marble it is in fact not for you and your lifestyle or personality. I had a comment on my last post from a reader named Molly that says she really regrets her marble because of the etching. I really appreciate her honesty. My friend Tessa is an amazing cook and enjoys being in the kitchen and making a mess. She knew marble was not the right decision for her kitchen and chose quartz in Lagoon, it looks amazing. You can see and read all about it here. It is more pricey than marble but she has NO WORRIES. And it looks great. So you just have to know what works for you. After a lot of research, Tessa made the best decision. She also says she was never totally set on marble like some of us crazies get, she actually wanted soapstone but decided it was too dark. Soapstone is another post. It’s amazing too but dark and has some maintenance involved. Point is if you REALLY want marble you can probably handle some of the issues but if you aren’t dying to have it something like quartz may fit the bill. How do you CLEAN it? Well not with bleach or 409. Anything with vinegar is damaging. This may freak some people out who want to disinfect their counters. Soap and water work best with marble. 409 does make a stone cleaner that I read is okay for carrara but I haven’t tried it yet. I have wondered if the Mrs Meyers cleaner would be okay, I love that but I haven’t tried. If you have marble what do you use to clean? With marble, most people use one or more chopping boards so that really helps with cleanup and the need to disinfect. Just make sure your cleaners are natural with no vinegar. I think the J.R. Watkins will be fine but I haven’t really tried yet; Again, Edie’s fab post has a great link to cleaning tips. Isn’t it PRICEY? When it comes to price you just have to shop around. It’s marble. It’s not cheap but you might be surprised when comparing it to other commonly used materials. Be sure and ask if the quoted price includes demo and removal of what you already have in place. Also if you want the best price get plain ol carrara. That is what I have. Not calcutta or the other heavily veined more precious marbles. Many designers talk a lot about Calcutta and Oro and other fancy marbles and that’s great, they are gorgeous, especially in a large kitchen or bath where you want to do something dramatic. But for my little cottage I knew plain ol carrara was the way to go. Honed and sealed. And I did a plain edge. I will say I have been surprised more and more when working with clients to find out that simple carrara is (not the calcutta mind you but basic carrera) is cheaper than granite. And certainly less expensive than quartz and silestone and other man made products. Joni at Cote de Texas has calcutta and used it on her backsplash too..so pretty. Notice it has more veining than mine. Her blog is a wealth of knowledge on this topic! Read her post on the topic here. EDGE SEAMS AND PROFILE Now here is an issue you need to be aware of – EDGE SEAMS. My marble is 2cm thick, which is the least expensive. You can get 3cm even 4cm or larger thick slabs and if it’s in your budget I suggest it because it gives you a nice thick natural edge. My seam is very faint and my installers did a great job “faking” the double edge. 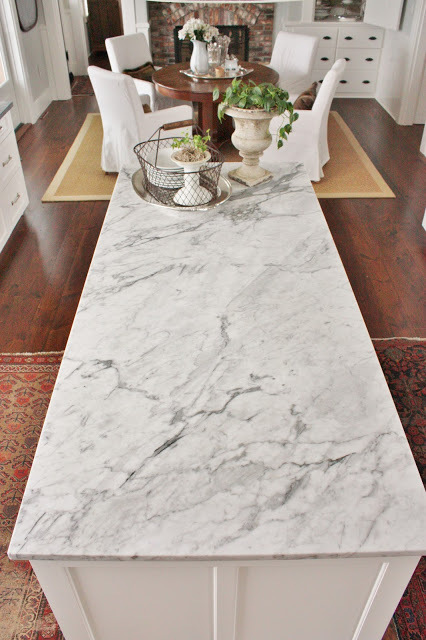 My friend, designer Jenny Johnston taught me that a 2cm slab of marble can be mitered to give the look of a 3″ edge. TALK TO YOUR INSTALLERS ABOUT THIS…..how this turns out really depends on the installation, if you are really concerned, consider getting a 3 cm slab. Of course that is more expensive. Another alternative to the edge seam is to get a decorative profile, that profile allows a place to hide the seam. I wanted a simple super eased edge so they seamed mine. One of my current clients decided to just go ahead with 3cm because of this concern. SO just be aware and discuss with installer. Is INSTALLATION MESSY/TIME CONSUMING? Speaking of installation, mine was so fast. One day (just an hour or two) to make the templates. Then on install day the tear out of my old counters (which were very sturdy wood frame counters with laminate and then grainte tiles over the old laminate) was SO FAST, they did the tear out and install all in one day. Again I am sure this depends on the installers and I highly recommend American Countertop Fabricators but all in all I was pleasantly surprised a how easy the install was in my kitchen.. It took much longer to get my tile work done on the backsplash. Be sure and ask if they will seal it the same day? Mine did. What about DANBY MARBLE? Danby marble is pricier but more stain resistant (which I don’t really think staining is an issue if you hone and seal but that is just my experience) and apparently danby does not etch as much as other marbles, at least according to one client. 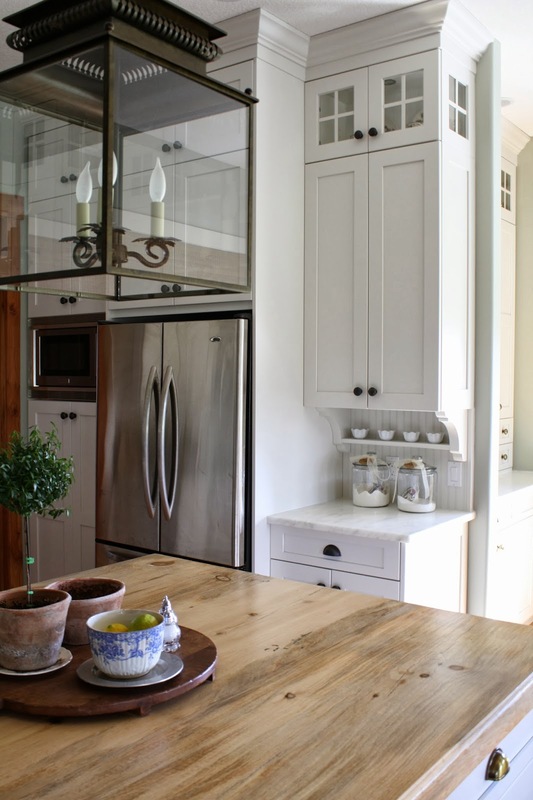 Andrea my Canadian client used Danby in her beautiful kitchen remodel pictured below and you can read more about her experience here. It will be interesting for us all to revisit this in 5 years or more. One has already had a lot of etching and the other had a chip and scratch. But they still like it. I sometimes wonder if the lighting in peoples kitchens makes a difference in how much etching they perceive. 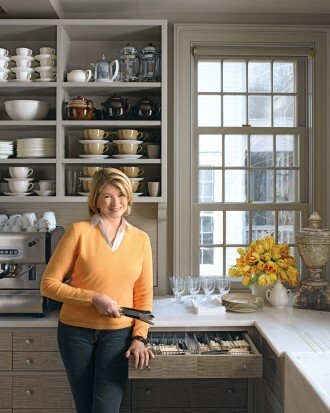 But I will say Martha has Danby, enough said for most people; You can read more about one blogger’s experience with Danby here. I must say Henry’s little mishap with the jar of salsa helped me get a grip. (Lucky for him he is very cute and it wiped up no damage done) God has a way of humbling us and reminding us to get over ourselves and our precious stuff huh?! It’s just that at the end of the day, stuff…kitchen counters so let’s don’t get wound to tight about it;; But I will say marble is a beautiful and honest material and I glad I finally took the plunge and brought it into our home. I like old and natural things with patina and wear and imperfections so it’s a good fit! What about you? 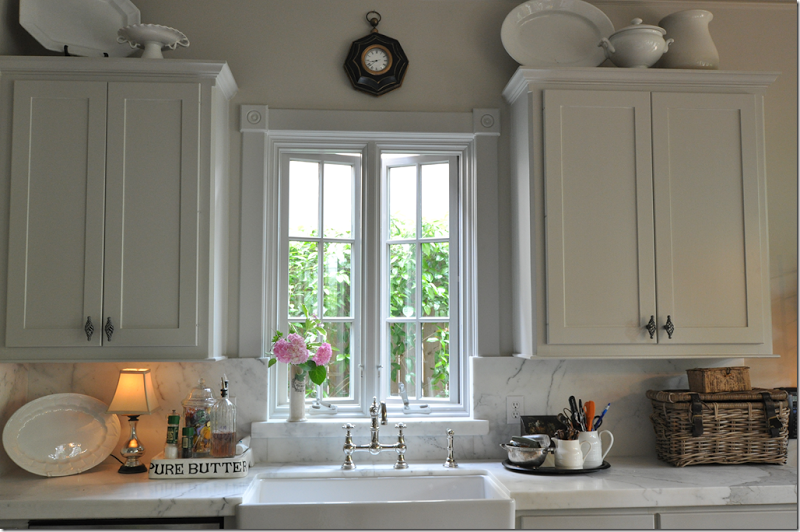 Have you used marble while redoing a kitchen or bath? Is it honed or polished? How do you clean it? Do you feel like you have to baby it? Would you install it again? I use Mrs Meyer’s and it works great! I also bought a fancy marble cleaner, but never use it as I love the Meyer’s scents. Martha has Danby? Well, I never knew! Great post on marble-I never for a second regret choosing it, but I did go in very informed, and knew the risks! This is a great, realistic post. We put marble in our kitchen a few years ago, and it certainly has taken a beating. We -baby- the marble… Cutting boards, towels under foods, etc. I love he look (fom a distance, not the close -up etches), but I think it’s more realistic to do a pastry area with marble and use a different surface for the rest of the kitchen. Thanks so much for this, Holly! We’re planning a small reno for the spring, and I’ve had my little sample slabs of carrara and silestone for weeks and weeks, trying to decide. We like the depth of the carrara so much more, and this post has alleviated some of our concerns! You read my mind. I put Crema Marfil on my bathroom counter when we remodeled. Planned on using granite but all the pieces I saw were too busy. My re-modeler told me it was too high end for my house….bah!!! It did get a bit of an etch where some cosmetic or other landed but it barely shows and I still love the way it looks. I did talk to the man before they cut it. It had a beautiful vein through it which I wanted to show. He would have tried not use that piece if we hadn’t talked. I would have been so sad. 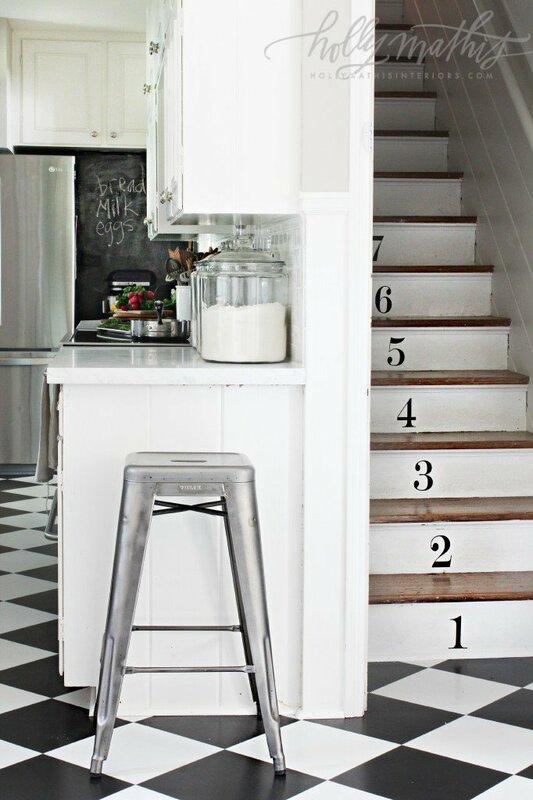 Ever re-do the kitchen again, I think I would want marble. Put granite in but I am happy with it too. 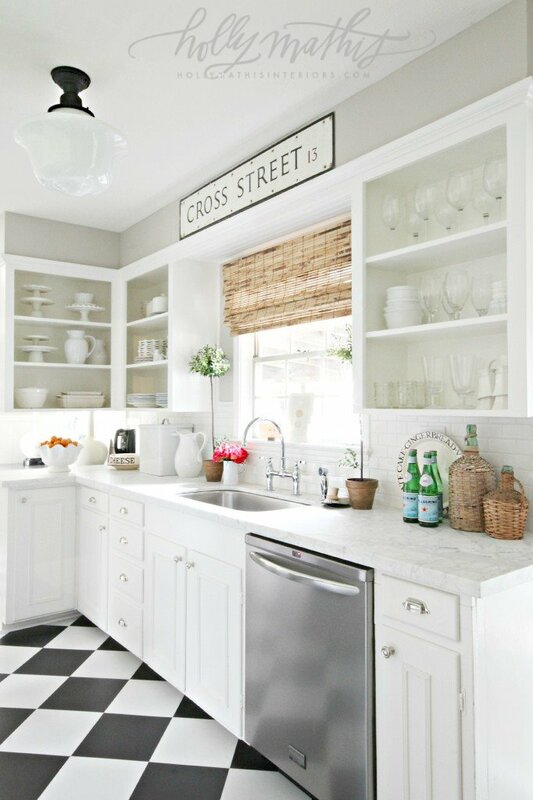 Love the clean look of Carrara though. Super helpful post- thank you! I love your kitchen. Thank you, Holly, for such a helpful post! We are right in the midst of making decisions for our budget kitchen reno on our new home, so this was so timely! I love the look of marble too, and I was shocked to learn that it tends to be cheaper than quartz. I’m looking forward to checking out all the helpful links you provided as well. Thanks again!! Henry meets marble… love it! Your counters look wonderful. Love the floor too! 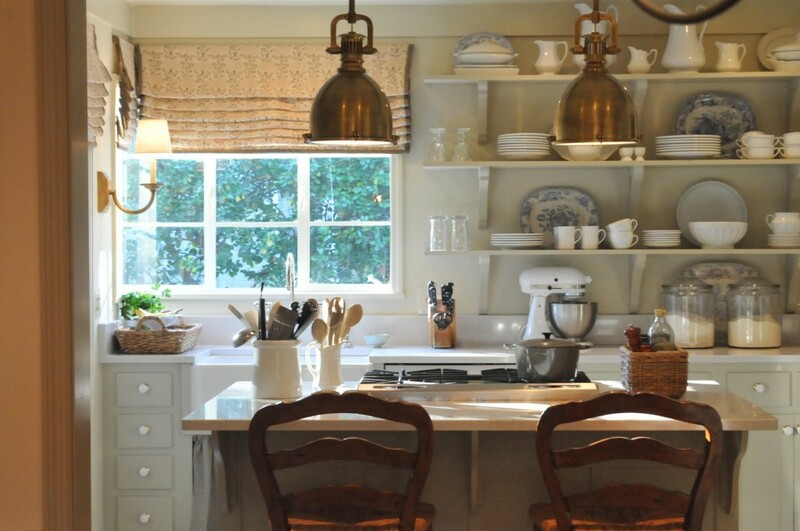 What a great post…your kitchen is gorgeous! I would be perfectly fine with any imperfections marble brings. I love the look and appreciate the wear and tear beauty that comes with natural materials. Your kitchen looks beautiful! Lovely…we have white corian and funny that after all these years I never really noticed the scratches and etching it has! Guess marble will work for me! Hoping to switch over soon…. Just read an article that swore by Magic Erasers for marble stains. Might be worth a try. We love our marble. We haven’t experienced any stains but lots of etching. I am still over-the-moon in love with it. Thank you for including my Danby marble in your write up! We are positively thrilled with our selection! It is absolutely gorgeous, and reasonably priced at $19.95 per square foot (for 3 cm). We are very much in the “new baby” phase… and yet we still have an etched ring where someone placed a messy coffee mug. 🙁 The etch marks do buff out with Comet with Bleach Scratch-Free, as recommended on the Vermont Quarries website, but you must re-seal afterwards, which we plan on doing every six months or so. Would I buy Danby marble again? Absolutely YES!!! But you really must be educated going in to it, and be willing to either be very careful or live with some imperfection. We are willing to do both. thanks for the reminder on the spelling of calacatta;; that’s a tricky one! i’ve really enjoyed reading about everyone’s experiences and thoughts on marble, great discussion, thanks Glam pad for leaving more info on your Danby! Great post! 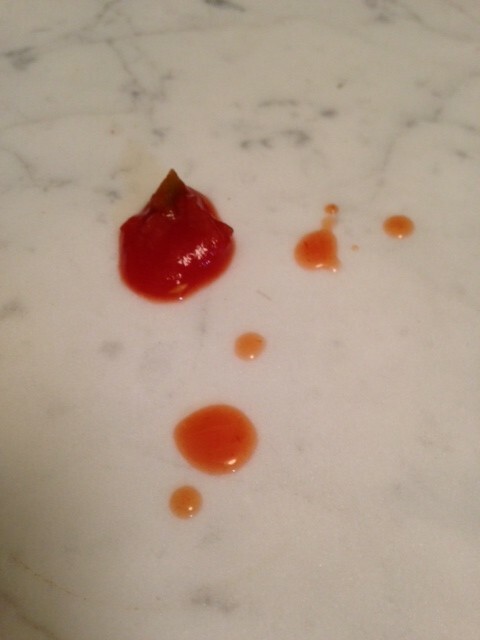 I think it was on Joan’s (for the love of a house) post about marble counters that she wrote about the “urban legend” that Meg Ryan just had her entire marble countertop wiped down with vinegar or something like that, so that the whole thing would be evenly etched from the get-go. I’ve always wondered if that would actually work or if you’d somehow make it look worse. I love Carerra Marble as well. I had carrera marble countertops installed in our kitchen (in Charlotte). The only reason the Coliseum looks the way it does is because most of the Carrara marble was looted and used for stairs, counters in fact any kind of building possible. 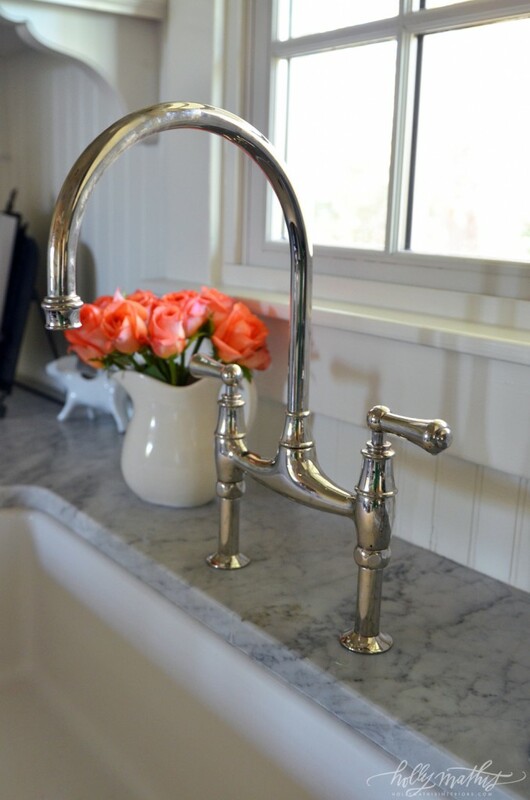 I just love the sophistication and beauty of the Carrara. Thank you and again, it’s beautiful. be. An annual gas safety inspection could save lives. Please tell me the name of the sealer on the marble. I have just had honed marble installed and they used Granite Shield It is very shiny like glass but the shield seems to be etching. There are dull spots all over . Consequently it never looked honed and the I believe the shield is not holding up. I have heard that some honed marble is oiled. In information on that process? Hi! You mention a sealer that is Houston based that guarantees no stains fro up to 15 years. Do you know the name of the brand or company? 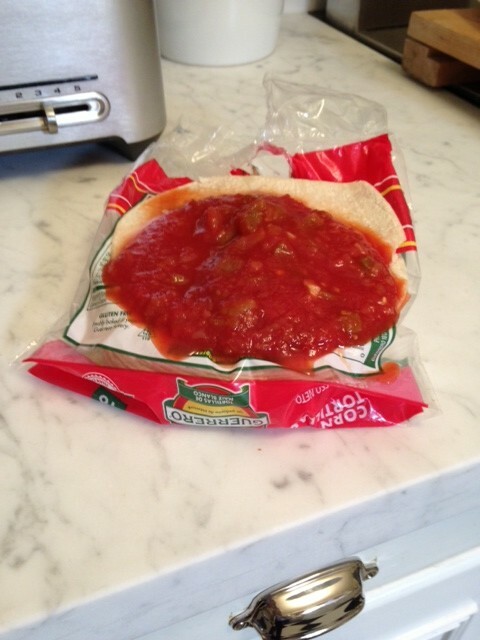 Thank you – this post was VERY helpful!! Great blog post. So good to see a realistic view on using marble as a worktop in a kitchen. 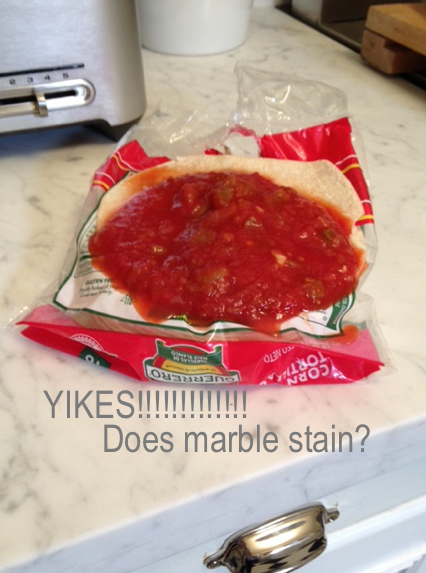 I know the sealer that “guarantees” 15 years without stains – check the small print! I think you’ll find it’s worthless. For me, the best sealer for this honed marble is Fila Fob which will protect against grease and water based stains. I’ve been using Fila for 13 years now and not had any problems. But nothing protects against acid etching, that’s why I would choose honed marble on a worktop – any etching shows up less. I noticed that Caesarstone has a new color called #5131 Calcutta Nuvo. It looks like it might be the best of both worlds. Have you seen this product in real life? Is it convincing? 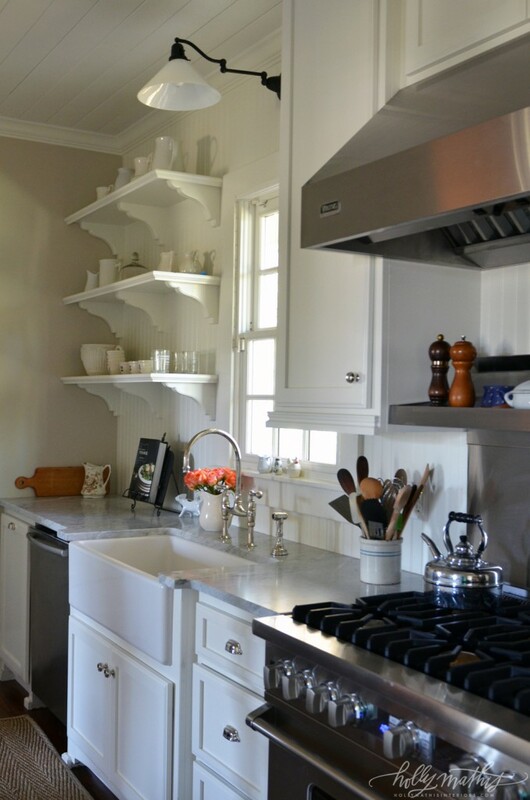 Holly…What type of farmhouse kitchen sink do you recommend with a carrerra marble countertop? White fireclay, white cast iron, white or carrerra marble? We currently have a nickle-plated copper farmhouse sink which has tarnished that we must replace. I know I don’t want stainless steel. Can’t tell what you used for your designs above? ps. What sink material was used in the Louisiana kitchen above? size tile, slab and other stone work. crystal with 7-per cent polymer resins. It is super-hard, non-porous thus requires low maintenance. countertop stone and doesn’t need to be resealed. projects, and countertop blanks for stone fabricator and cabinet manufacturer as well. hotel, motel, resort, townhouse and mulitfamily house. Carrera is top of the line. I’m not sure what designers are marking it third on the list. And you most certainly can use bleach and peroxide to remove stains. Like any stone, you can sand and buff out (Magic Erasers are micro sanders-FYI), but remember that you will need to seal it ever time afterward. All Carrera counters will need to be resealed 3-4 times a year. Chips can be sanded out as well. I’m an artist who has worked with and sculpted different marbles and an interior designer.